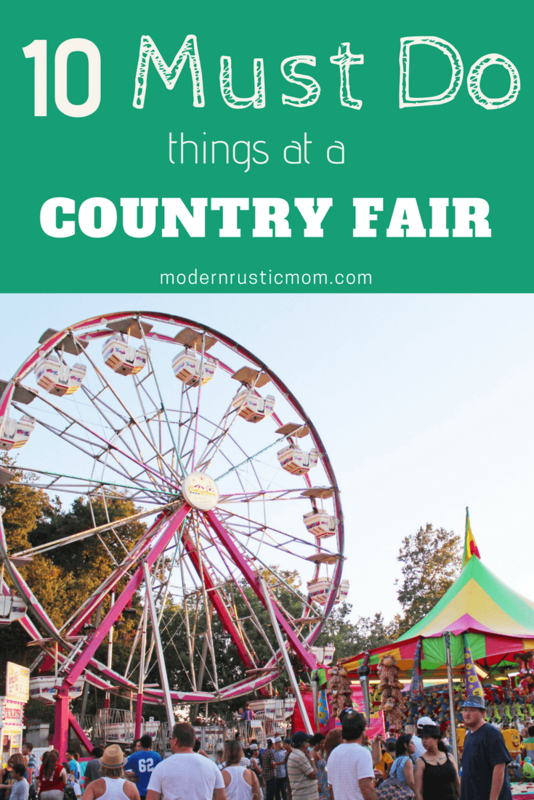 One of my most favorite things about summer time – Country Fairs. There is one almost every other week throughout the summer around here. They range from small to large with even the smallest towns hosting the largest fairs. There’s something for every age and interest. If it’s your first or 50th, check out the 10 Must Do Things at the Country Fair. 1) Check out local crafts competition. 2) Munch on the famous country fair food. 3) Top it off with local ice cream, fried dough, cotton candy, or kettle corn. 4) Watch a tractor pull or ax throwing competition. 5) Win a prize for your sweetheart or kids. 6) Play bingo and buy raffle tickets. 7) Check out the animals. 8) Bring home a souvenir. 9) Catch a concert. Bonus points if you dance with your sweetheart. Heck, even enter one! This sits on my bucket list. Each fair will have a crafts competition that may include quilting, flower arranging, knitting, cake/cookie baking, or jelly/jam jars. My aunt even won a blue ribbon at a provincial fair in Canada so it’s in our blood. The prizes can be small but some contests are regional like the King Arthur (flour) baking competition. If you’ve never seen an ax throwing competition, definitely look for it at your fair. Not all fairs have this but I know several competitive forestry teams in the region. There is ax throwing, sawing races, and chopping races. I get nervous watching the underhand chop competition where the competitor stands on a log and chops the log just between his/her feet. 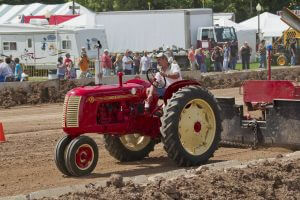 If there aren’t any timber sports, check out the oxen or tractor pulls. This is a little less adrenaline pumping but it’s always fun to watch the parade of antique tractors in a strength competition. Maybe you’re ace at the water gun balloon pop, the captain of basketball swooshes, or or a master of skeeball. Whichever game you rock, take a few chances to win something for your loved one. You might be a little confused that I’m encouraging you to spend money with a low chance of return but hear me out. 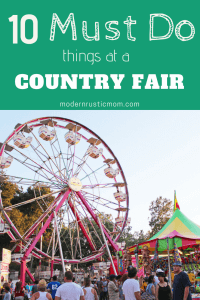 Most of these country fairs, at least the local ones, are the large annual fundraiser for local fire departments, granges, or other community groups. It’s there one BIG one for the year and people volunteer for weeks and months organizing it so they can raise some money for their organization. Before you buy the tickets or play the games, check who receives that money. I remember, as a kid, my mom would always give use money if we were using the money for bingo because that money went to the fire department. At this stage, this is probably my daughter’s favorite part of any fair. There are usually soft bunnies, large turkeys, and sweet cows to meet. There are usually a couple of vendors that catch my eye as we meander through the aisles especially adorable t-shirts, cute skirts, and unique jewelry. It can be hard to find some of these online or even on Etsy so if I love, I try to get it! Some fairs feature musical acts and even at the smaller fairs, you might see someone who is just about to hit the big time. Then, usually at the county or state fairs, there can be huge headliners. What I love most about these is that the fair locations tend to be closer to us here in the sticks instead of taking a plane, train, and automobile into a city to catch a concert. Some fairs host fireworks on the last night of the event. If your kids like fireworks and can manage to stay awake until dark, it might be worth bringing a picnic blanket and watching the colorful display. 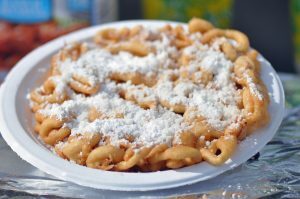 What are your favorite memories/activities at the local fair? Tell me in the comments! We just went to the fair yesterday, but I did most of the things on this list. Nailed it! Haha, I hope that means you had some fried dough! !